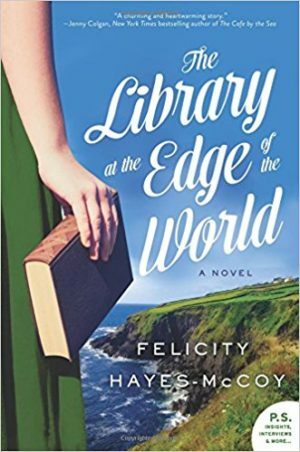 I recently read the book The Library at the Edge of the World by Felicity Hayes-McCoy. Taking place in a small seaside community in Ireland, Hanna Casey returns to her mother’s home after living in London for years after her divorce from her cheating husband. Before marriage, Hanna had dreamed of studying to be a librarian and eventually working at a major public library in London. But when she met her English husband in her teens, she gave up her dream to support her husband’s burgeoning career as a successful attorney. Upon finding out he had a mistress for years who was a close friend of the family, Hanna took their daughter and returned home to Ireland. Deeply embarrassed, she appears standoffish and churlish to members of her community. Her relationship with her overly critical mother grows increasingly tense and she becomes determined to fix up a run-down cottage that was left to her by a great-aunt. She now runs a tiny library in town and drives out to distant communities with her mobile library van. It was certainly not the life she had planned or enjoyed with her husband in England. But when the town council plans to close it down, Hanna discovers she has the support and affection of her community. She also discovers she has more strength and confidence than she realizes as she fights the powers-that-be to save her job and continuing her mission to provide books to those in her far-flung community. Even though Hanna’s original plans do not materialize, she learns to appreciate the richness of her present life and make peace with it.